The Vice President of the Republic of Indonesia (Indonesian: Wakil Presiden Republik Indonesia) is the first in the line of succession in the Republic of Indonesia. The Indonesian Vice Presidency was established during the formulation of the 1945 constitution by the Investigating Committee for Preparatory Work for Independence (BPUPKI). The office was first filled on 18 August 1945 when Mohammad Hatta was elected by acclamation. The election was conducted by the Committee for the Preparation of Indonesian Independence (PPKI) because the body responsible for the Vice-Presidential elections, the People's Consultative Assembly (MPR), had not been formed yet. In the early days of the Republic, the office of Vice-President showed how important it can be. On 16 October 1945, Hatta announced a Vice-Presidential decree which turned the Central National Committee of Indonesia (KNIP) equal status with that of the President. As a result of this decree, the KNIP was able to separate the role of Head of State and Head of Government on 11 November 1945. Although a new constitution had not been set up yet, Indonesia was now a de facto Parliamentary Democracy. During the Indonesian National Revolution, both Hatta and Sukarno were captured by the Dutch in Yogyakarta on 18 December 1948. Together with Sukarno, Hatta gave mandate for Syafruddin Prawiranegara to form an emergency Government. This was done and the Emergency Government of the Republic of Indonesia (PDRI) was formed in Sumatra with Prawiranegara as Chairman. Prawiranegara handed back his mandate to Sukarno and consequently, to Hatta on 13 July 1949. Now officially an independent nation, Indonesia adopted the Provisional Constitution, a document which defined the President's role as a ceremonial Head of State whose role was to appoint a Prime Minister on the advice of formateurs. Although the Vice Presidency continued to exist, the form of Government was now officially a Parliamentary Democracy and there was not a significant role for the Vice-President to play. On 1 December 1956, partly because of his differences with Sukarno, Hatta resigned from the Vice Presidency. For the next 17 years, the Vice Presidency remain vacant. In December 1965, there were calls for a Vice-President to be named to assist President Sukarno during the times of uncertainty. The idea did not gain momentum and the Vice Presidency continued to remain vacant as the Presidency passed over from Sukarno to General Suharto. In March 1973, the Vice Presidency vacancy was filled by Hamengkubuwono IX when he was elected by the MPR. After Hamengkubuwono IX and throughout the New Order, the Vice Presidency were successively held by Adam Malik, Umar Wirahadikusumah, Sudharmono, Try Sutrisno, and BJ Habibie. During his time as President, Suharto would reduce the Vice Presidency to a sinecure. A Vice-President was reduced to making sure that Government policy was being implemented and attending ceremonies. The Vice-President did not even take on Presidential duties when Suharto was either out of the country or ill. The office would derogatorily be known as Ban Serep (Spare Tire). Despite being a largely figurehead role, the Vice Presidency twice became a source of controversy with Sudharmono having to face various obstacles en route to being Vice-President in 1988 and Try being preemptively nominated in 1993. With Suharto's fall in May 1998 and Habibie's accession to the Presidency, the Vice Presidency once again became vacant. In October 1999, Megawati Sukarnoputri was elected as Vice-President and the office began to gain significance. Megawati was delegated genuine tasks to do  and in 2000, she even became responsible for the day-to-day running of the Government. During the 2001 MPR Annual Session, it was finally decided that from 2004 onwards, the Vice-President, together with the President, will directly be elected by the people. The substantial role that the Vice Presidency is now going to have was evident in the way in which the 2004 Presidential Candidates chose their running mates. 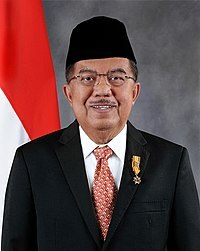 At the end, Jusuf Kalla became Indonesia's first directly elected Vice-President. The 1945 Constitution: The Vice-Presidential candidate has to be of Indonesian origins. The Provisional Constitution: The Vice-Presidential candidate has to be an Indonesian citizen aged at least 30 years old. He cannot be someone who is deemed to be undesirable or has had his right to take part in elections stripped. He is also required to not be involved with any private corporations. The Amended 1945 Constitution: The Vice-Presidential candidate has to be an Indonesian citizen since his/her birth, who has not willingly become a citizen in another nation, has not betrayed the nation, and is physically and mentally capable of performing the duties. Amended Constitution also states that further criteria will be determined by laws. The Vice-President is also required to be nominated by a Political Party or a coalition of Political Parties. has a vision, mission, and programs to executing the office of Vice-President. 2nd Resolution of 1973 MPR: The Vice-Presidential candidate has to make a statement in writing which declares that he is able to work together with the President. The 1945 Constitution: Together with the President, the Vice-President is elected by the MPR with the largest number of votes. The Vice-President-elect is also required to read either an oath or a promise of office before officially becoming Vice-President. The term of office is Five years and after that the Vice-President can be re-elected again. The Provisional Constitution: Together with the President, the Vice-President is elected according to rules specified by laws. The Vice-President-elect is required to read either an oath or a promise or a statement of office before officially becoming Vice-President. The Vice-President is constitutionally required to live where the seat of Government is. The Amended 1945 Constitution: Together with the President, the Vice-President is elected directly by the people on a ticket. Further election rules are determined by laws passed by the DPR. The Vice-President-elect is required to read either an oath or a promise of office before officially becoming Vice-President. The term of office is Five years and after that the Vice-President can be re-elected for only one more term. Oath of Office of the Vice-President of the Republic of Indonesia : "I swear by Allah to fulfill the duties of President (Vice President) of the Republic of Indonesia to the best of my capabilities and in the fairest way possible, to uphold the Constitution by all means and to execute all laws and regulations as straightforwardly as possible as well as to dedicate myself to the service of the Nation and the People." Pledge of Office of the Vice-President of the Republic of Indonesia : "I solemnly pledge to fulfill the duties of President (Vice President) of the Republic of Indonesia to the best of my capabilities and in the fairest way possible, to uphold the Constitution by all means and to execute all laws and regulations as straightforwardly as possible as well as to dedicate myself to the service of the Nation and the People." None specified by all constitutions. The convention has been for the President to delegate a task for the Vice-President to do. The 1945 Constitution: The Vice-President replaces the President in the event that the President dies, resigns, or is unable to perform his/her duties for any reason. The Provisional Constitution: The Vice-President replaces the President in the event that the President dies, resigns, or is unable to perform his/her duties for any reason. The Amended 1945 Constitution: The Vice-President replaces the President in the event that the President dies, resigns, or is unable to perform his/her duties for any reason. If the President and the Vice-President dies, resigns, or is unable to perform his/her duties for any reason, the government will be taken over together by Minister of Foreign Affairs, Minister of Internal Affairs and Minister of Defence. Then the MPR will elect a new president from the two candidates nominated by the political parties whose candidates are the winner and the runner-up in the past presidential election. If the Vice Presidency becomes vacant with the President still holding office, the President nominates two candidates and the MPR has to elect a new Vice-President out of the candidates within 60 days. Under the amended constitution, the Vice-President can now be impeached and removed from office. If the Vice-President is viewed to be unfit to perform his duties and has committed crimes such as corruption and betraying the Nation, the DPR can appeal to the Supreme Court to try the Vice-President. Furthermore, the DPR can ask the Constitutional Court to look into the matter, during which it has 90 days to make a decision. With the decision made, the DPR can motion for the MPR to convene. The Vice-President would then be given one last chance to defend himself before the MPR makes the decision whether or not the Vice-President should be impeached. Law 7 of 1978  stipulates that former Vice-Presidents are entitled to a pension. Former Presidents are also entitled to a house with electricity, water, and telephone bills covered by the Government. In addition to that Former Vice-Presidents will have free healthcare for his family and a car with chauffeur. ^ "Usulan MTI tentang Amandemen UUD 1945". Archived from the original on 1 June 2007. Retrieved 12 March 2007. ^ Hughes, John (2002) . The End of Sukarno: A Coup That Misfired: A Purge That Ran Wild (3rd ed.). Singapore: Archipelago Press. p. 215. ISBN 981-4068-65-9.